What went wrong the day teen died in van? 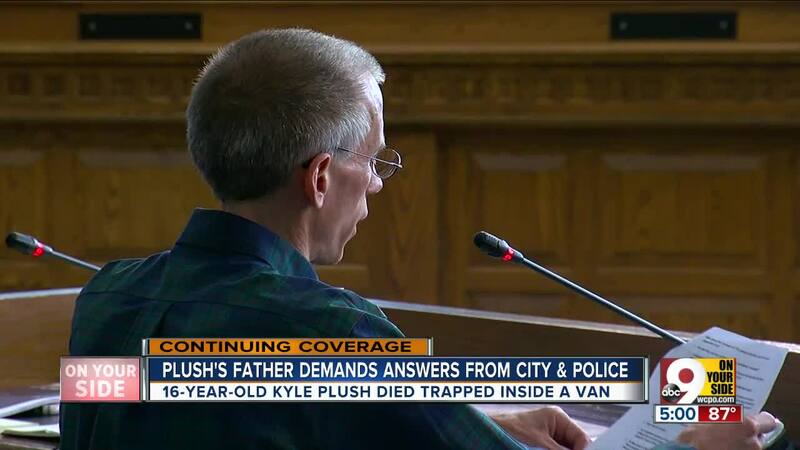 CINCINNATI -- Kyle Plush's father, Ron, hoped a comprehensive report from the Cincinnati Police Department might explain what went wrong the day his son died. Instead, it left him and Cincinnati City Council members with even more questions. Plush, 16, became trapped inside his minivan at the Seven Hills School last month and suffocated, despite making two calls to 911 for help. Ron Plush found his son dead later that night. 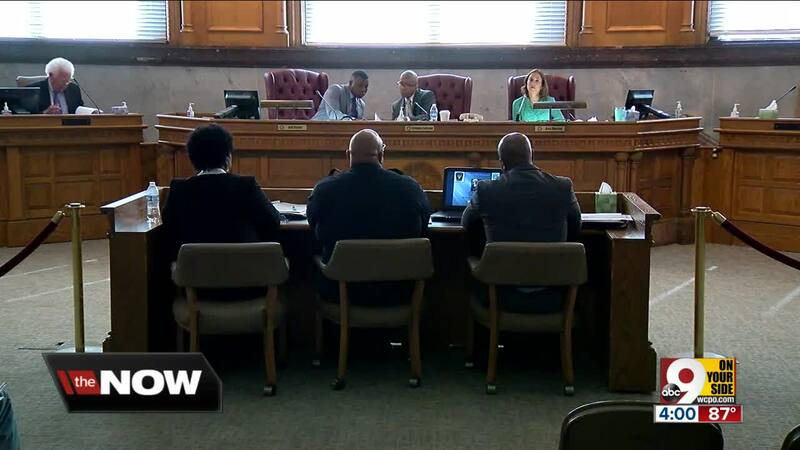 Mayor John Cranley called the police department's investigation "incomplete." Ron Plush read and turned over a two-page list of questions, covering technical problems, human failures and policy loopholes. Among them: "Are the right checklists and SOPs in place, standard operating procedures?" "If not, we need to implement them," he said. He and Plush's aunt, Jodi Schwind, also wondered if officers responded with enough urgency. And why didn't officers simply go from van to van? "If you look at the video, there is two vans in the lower lot," Schwind said. "There’s a black van and there’s a gold van. That’s it." Others wondered why the officers didn't ask for help locating a "Kyle," since one of them had called Plush's cellphone and got his voicemail greeting. "Kyle did everything he should've done -- everything a mom or dad would tell their child to do," Councilwoman Amy Murray said. "And he was failed horribly." The committee will meet again in two weeks. Hamilton County Prosecutor Joe Deters has his own investigation into Plush's death. Isaac also said he's asked for a technical review of the ciy's 911 system from outside groups; he hopes to know which organization will be doing that later this week. Someone at the 911 center heard Plush say he was going to die. Stephanie Magee, who took Plush's first 911 call, had trouble hearing him. Isaac revealed Plush's cellphone was in his pocket, and he was using Siri to dial for him. As she tried to find Plush's location, Magee asked two other calltakers to listen to the call on playback, hoping they'd be able to get more information. One of those calltakers believed Plush was an elderly woman and heard him say, "Help me I'm going to die." Editor's note: WCPO has not broadcast or published Plush's 911 calls due to their graphic nature and out of respect for his family. But the fact that Plush feared for his life never got to the police officers, Brian Brazile and Edsel Osborn. Magee didn't note the banging sounds Plush made, either. Magee received an "acceptable" rating on how she handled the call. "What about the phrase 'I’m going to die here?' and 'I’m in need of desperate help.' Are leaving out any of those items considered acceptable?" Ron Plush said. There was another problem hearing Plush's 911 call. Amber Smith, who answered Plush's second 911 call , heard him say "Siri, Siri" but nothing more when she tried to talk back to him. Smith muted her headset microphone and activated a system used to communicate with hearing-impaired callers. That system reduces the call volume by 75 percent to protect the calltaker's hearing, and Smith didn't know how to turn it off once she launched it. She tried locating him, but her terminal froze up and the map didn't appear on her screen. She found a prior call from the same number, but that incident was closed -- and so she couldn't add more information to it. Smith tried to enter a new incident into the system, but it froze again. She clicked the "exit/save" button and assumed it processed. Officers and the 911 center didn't contact the school about Plush's 911 call. "I don't understand why, if they called back and the phone says, 'Hello, this is Kyle'... why you wouldn't have gone to Seven Hills and said, 'We have a call that there's a Kyle in a van. Can you help us?'" Murray said. ...but a Hamilton County deputy did. Deputy Douglas Allen, who directs traffic, got Plush's number from the officers. They let Allen look at the computer screen in their police vehicle, which indicated they were looking for a woman trapped in a van on Seven Hills property. Allen talked to Robert Horne, Seven Hills director of operations, and let Horne listen to Plush's voicemail greeting. They thought the voice sounded like a young child, but Horne said no students were reported missing. The deputy tried to get a better location. Allen told the Cincinnati officers he'd look around some more and called Cincinnati's 911 center to ask for more information. He looked inside a white van, but not inside Plush's gold minivan. He also called his own communications center, asking if more could be done to pinpoint the caller's location. After talking with Horne, Allen called Plush again and left a detailed message. He didn't remember driving past a gold Honda Odyssey during his search. Officers don't have high-quality maps in their patrol vehicles. GPS coordinates from Plush's first call were within feet of where he'd be found dead hours later. Cincinnati police have a mobile data computer in patrol vehicles. But Jayson Dunn, the city's information technology director, said those computers have outdated, low-quality maps. Also, Dunn said, a call's latitude and longitude are not sent automatically to mobile data computer. Instead, officers get an address, not a map with precision coordinates. In this case, the address was 5471 Red Bank Road, approximately where Plush was parked. An internal investigation found most policies were followed. The police department's internal investigation found Brazile and Osborne violated procedure in failing to turn their body-worn cameras back on after talking with Allen. However, it found both acted reasonably based on the information they had. They didn't get out of their vehicle because they thought it would be better to drive around the school's multiple parking lots, with one officer looking out each side of the patrol vehicle. "It was a lot quicker, more efficient ... and that made sense to me," said Capt. Kim Williams. Isaac also said they expected someone would direct them to a person in distress when they arrived at the busy, crowded parking lot. Surveillance footage shows several people walked to vehicles parked near Plush's, got inside and drove off, apparently seeing nothing out of the ordinary. "I've never seen a tragic accident occur like this in my 30 years on this job," he said. "I believe the officers had the fullest intent to help, but they received limited information." Both calltakers also followed policy and procedure, according to the investigation. Plush's father vowed to make sure the city fixes the problems. Ron Plush urged the city to "dig deep" to fix the problems that failed his son. He criticized the city for not fixing problems at the 911 center that have been a topic of discussion for years. He also questioned if his son's death truly was a unique, unavoidable tragedy. "Was this a perfect storm, or a series of multiple failures?" he said. He urged the city to "steal shamelessly" from places with better practices, and to have first responders meet with dispatchers and dispatchers will calltakers so the quality of information doesn't deteriorate as it goes from a 911 call to the actual people responding in the field. Plush also found too much subjectivity in the response, noting that officers' comments indicated their personal feelings may have gotten in the way of how hard they looked for his son. "We will continue to ask the difficult and somewhat uncomfortable questions," he said. "Kyle will give us the strength and guidance to get the job done."